The Current River has been rated the #1 canoe camping river in the United States and one of the most scenic canoe trips in the Nation! The Current River was the first river in America to become a National Riverway. Most spring-fed of all the Ozark Rivers, the Current may be floated any time of the year. One after another, springs discharge clear, 58 degree water into the river in amazing volumes. 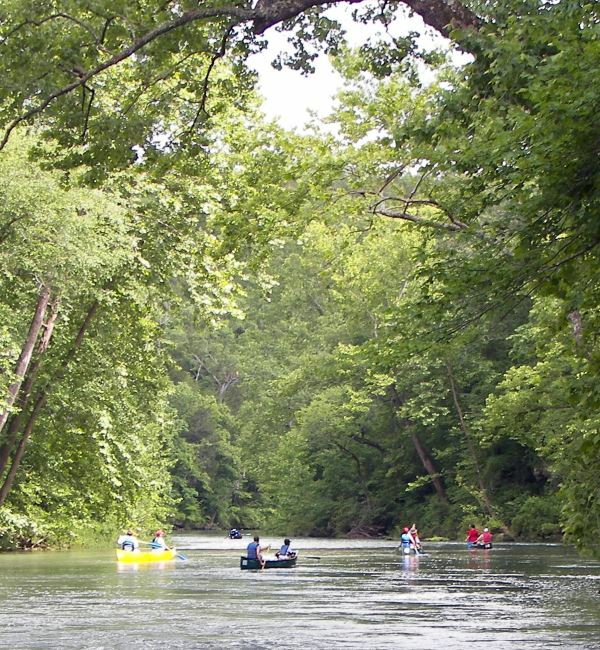 The Current River is the principal stream of the Ozark National Scenic Waterways and should not be missed! What sets the Current River apart as a great canoeing river is its springs. Welch Spring, Pulltite Spring, Cave Spring, Blue Spring, and Big Spring among others all feed into the Current making this a cold, clear, beautiful river well worth any time spent on it. The Current River is a class I, occasionally a class II river. The average gradient is 4.4 feet. * Difficulty is measured by class from I – IV and gradient is the feet of drop per mile. Click here for a list of canoe, kayak or tube rentals near the Current River on our Canoeing page. Click here for a mile by mile description of the Current River, courtesy of the Missouri Department of Conservation. For Current River water levels @ Montauk State Park, CLICK HERE. For Current River water levels @ Akers, CLICK HERE. For Current River water levels @ Powder Mill, CLICK HERE. For Current River water levels @ Van Buren, CLICK HERE. For Current River water predictions for Van Buren, CLICK HERE.